How do I enter data to my goal? There are a bunch of ways to submit info! The date-value-comment format is used across all of them, though it may be presented slightly differently. Keep scrolling down for examples! To add data using the dashboard, you'll need to have the row for the goal expanded using the toggle icon on the left of each goal image. Then, select the correct day for the datapoint using the dropdown and enter the datapoint value in the middle box. If you want, you can add a comment in the text box, but it's not required. Click Add Progress to submit! Use the box on the right-hand side of the goal page, to the right of the graph image, to enter data. You can use the Form Entry shown on the left below, or click the Advanced Entry link to swap to a shorthand text field instead. 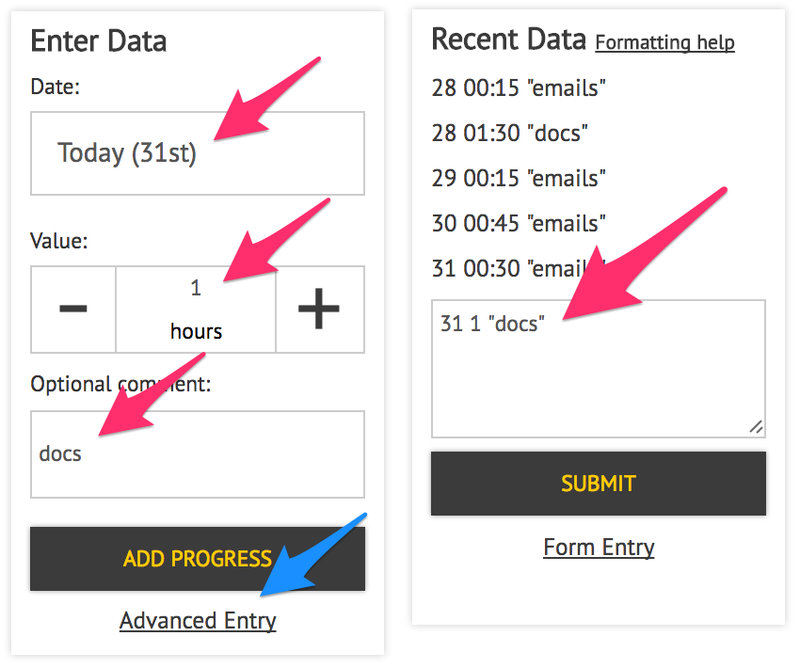 Advanced entry will let you enter multiple datapoints for any day in the past, so it's a handy option to have! Check the iOS and Android pages for more detail and screenshots! Send an email to bot@beeminder.com! The easiest way is to reply to the reminder emails Beeminder sends. You can also send non-reply emails; make sure the subject line contains your username/goalname so it knows where to enter the data. You should use the format shown in " what is my data?" in the emails. The bot will reply with a format reminder and copy Beeminder support if it can't parse what you send. The bot will reply to you when it receives your data, letting you know whether your graph was updated or if it had a parsing problem. SMS entry works very similarly to email. Just include your goalname in front of the standard email data entry format. We also have a separate article all about our SMS bot. If your goal has an automatic data source, most of this doesn't apply! For most data sources, you can press the refresh button that appears in place of data entry boxes to fetch the latest data from your data source. Some sources (most popularly IFTTT and Zapier) push data to Beeminder, and the fetch button does not actually "fetch" anything! You'll need to visit the service to ensure that the applet/zap/task was completed successfully and sent information to Beeminder. Check the help page for each integration to learn more!